When Mrs. Rosa Parks refused to get out of her seat for a white man, the Black community enmasse said, "Enough is enough." Several ladies had been insulted and assaulted by white bus drivers and policeman, viz., Claudette Colvin, Mary Louise Smith, Aurelia Browder and Susie McDonald. The women joined as plaintiffs and filed a suit against the city of Montgomery for its racist and discriminatory policies on public transportation. Mrs. Rosa Parks provided the impetus for the people's "street heat" and the lawsuit provided the structure to bring about fundamental social change in national policy. Mrs. Parks deliberate determination to say "no" to indignity will be her lasting legacy to me. I pray that young people today will inculcate this self-respect into their characters and with deliberate determination say "no" to drugs, prostitution, disrepect and any other behavior that leads to a life of indignities. Mrs. Parks def iance to remain in her seat was the last straw that broke the back of "jim crow" laws and customs. When Mrs. Rosa Parks with her quiet strength sat down, the world stood up. the death of Mrs. Parks has put the rich history of the movement on the mainstream agenda albeit momentarily. it would be wonderful if there was a call for a one day national bus boycott december 1 commemorating Ms. Parks 50 year legacy along with reminding the nation about the continual perniciousness of racism highlighting katrina, criminal and environmental justice, unemployment, etc. "To laugh often and much, to win the respect of intelligent people and the affection of children, to earn the appreciation of honest critics and endure the betrayal of false friends, to appreciate beauty, to find the best in others, to leave the world a bit better, whether by a healthy child, a garden patch...to know that even one life has breathed easier because you have lived. This is to have succeeded!"  Ralph Waldo Emerson. "Sick and tired of being sick and tired," as Fannie Lou Hamer once said, Rosa Parks was fed up with racial insult and on December 1, 1955 refused to surrender her seat to the white man who demanded it on a public bus in Montgomery Alabama. She was arrested. This was not the first challenge to racial segregation in Montgomery or in America but this time Rosa Parks challenge lit a fire that powerful winds of disatisfaction spread through the community. Almost a century of post-slavery insult and oppression was the tinder for those flames. But also, the times too were changing; history was asserting itself to right old wrongs. 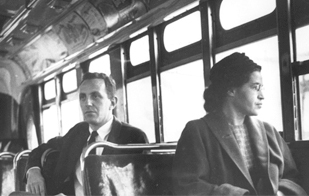 And at the pivot point of history in Montgomery was one woman in one seat on one bus. There was no great long range plan; just a decision to act. Some 50,000 black citizens united for a one-day bus boycott and realized that victory would be neither easy nor quick. At great personal sacrifice they then held the line-against bombs, police harassment and other acts of violence and intimidation-for 380 more days. This story  like freedom  is rooted in specifics: a people, a place, a time, and  also like freedom  it rises above all of these. It makes self- evident a basic truth that no democracy can afford to ignore or forget if it is to survive: freedom, equality, and justice must be for all. The Montgomery bus boycott turned local news into international headlines, local leaders into national symbols, and a local protest strategy into inspiration for a national grassroots civil rights movement that changed America and touched the world. I met Rosa Parks once when I was the Chairperson of the MLK March in San Antonio, Texas in the 1990s. She was our main speaker and we provided an old bus for her to ride in during the march. She was very humble and suprised that San Antonio had one of the largest marches (not a parade) in the country. She told me that, "times have changed but racism had not died away." I later became a city councilman in San Antonio, and to mark her visit to the city, I had the Public Works Departmant erect street signs in her honor. The majority of the City Council supported the idea except for a few whose actions verified the permanance of racism in America. The signs stretch from the African American community, through the central downtown business district, and goes into the Mexican American community. We, as former members of SNCC in San Antonio, Texas, are saddened by her death, but she left us with a fighting spirit that will endure. As long as racism spoils our land we will fight on. I doubt that I can write words about Rosa Parks' actual deed 50 years ago that would add to what I have already read from others. But as this list is essentially a record of history and thoughts about that history for the use both of students at all levels, and of historians, I'd like to call attention to one aspect that is known but has had little attention. Rosa Parks was employed, at the time of her historic deed, by Virginia Durr and her husband. As far as I know they were not members of the Communist Party. However, their attitudes and deeds, to the degree that one can compare whites and Blacks, were similar to those of Paul Robeson. That was extremely rare among Southern whites, and not too common in the North. I also gather, from the materials published in the past couple of days, that Ms. Parks' husband was the more consciously radical of the two, or at least the more outspoken as far as words were concerned. So Rosa Parks was not only a person of utmost dignity and self-respect but someone whose thoughts had been open to influence by the Left. Everyday, history is made by people whose names remain unknown as well as those who become eternal icons. In May of 1980, a woman who forever changed our country spent a week in our home. The East Bay Area Friends of Highlander Research and Education Center joined with founder Myles Horton to honor two of the Civil Rights Movements most courageous pioneers: Rosa Parks and Septima Clark. Clark broke ground as a pioneering force in citizenship training and voter education. The two women met at Highlander in 1955, a place where my own mother-in- law Margaret Landes was trained during the 1930s. Founded in 1932, Highlander is a civil rights training school located on a 104-acre farm atop Bays Mountain, near New Market, Tennessee. Over the course of its history, Highlander has played important roles in many major political movements, including the Southern labor movements of the 1930s, the Civil Rights Movement of the 1940s-60s, and the Appalachian people's movements of the 1970s-80s. Through books in our home library, her teachers and my own work as a writer, Anyania knew about the role Ms. Parks played in changing the course of history. Like millions of other African Americans, Mrs. Parks was tired of the racism, segregation and Jim Crow laws of the times. Through her commitment to freedom and training at Highlander Research and Education Center, her refusal to move to the back of a bus in Montgomery, Alabama on December 1, 1995, spawned a movement. Parks took a seat in the section of a Montgomery city bus designated for whites. She was arrested, tried and fined for violating a city ordinance. Mrs. Parks, a seamstress, often had run-ins with bus drivers and had been evicted from buses. Getting on the front of the bus to pay her fare and then getting off going to the back door was so humiliating. There were times the driver simply would shut the door and drive off. Her very conscious decision turned into an economically crippling, politically dynamic boycott and ended legal segregation in America. A three hundred and eighty two day bus boycott followed her morally correct and courageous act. In the course of preparing for Ms. Parks' visit, she noted to members of the committee that hotels just didn't suit her spirit and she preferred the tradition extended through southern hospitality of putting people up in your home. She then asked if I would mind if she could be our guest during her week long stay in Oakland. She made only one request of us: that we keep her presence a secret. She and her long time friend Elaine Steele were eager to be in a place where they could relax, listen to music and eat great food without being disturbed. The disturbed part was my greatest concern for between the bullet blasting drug wars and the press, I was concerned about how to maintain that part of the agreement. Our modest home in the Fruitvale community of Oakland, California had served as a cultural center and refuge to many writers, filmmakers, artists and activists including Sweet Honey in the Rock, novelist Alice Walker and poet Gwendolyn Brooks. Although we'd never even met, when Rosa Parks walked through our front door, she instantly became family. She and Anyania melted into one another's arms like a grandmother seeing her grandchild for the first time. One morning as Anyania was about to take off for school, the button on her dress popped off. It was a jumper filled with multicultural images of children my mother had made Anya. Ms. Parks asked if I had a sewing box, threaded the needle and sewed the button back on. My spirit spilled over and I just burst into tears. Anyania was so good at keeping the secret. I, on the other hand, wanted to blurt out to my family, friends and students at Mills College "Guess who's sleeping in my bed?" A few months ago, a former neighbor came by to pay a visit and started searching the scores of photographs hanging on the walls in our living room. She stopped, turned around and blurted out, "No that isn't." I instantly knew the photograph to which she was referring. Along with pictures of Fannie Lou Hamer, Eleanor Holmes Norton and Jim Forman hangs a very precious photograph of Rosa Parks surrounded by my then seven-year-old daughter and her playmate Kai Beard. Dottie was simply undone that in all the years she'd come into our home, she like so many others simply thought the woman sitting next to Anyania was her grandmother. A few weeks after she returned to Detroit, Ms. Parks sent Anyania an exquisite portrait of her painted by Paul Collins. That portrait now hangs in Anya's home in Brentwood, California where my grandchildren Maelia and Elijah live, read and play everyday. Daphne Muse is a writer, social commentator and director of the Women's Leadership Institute at Mills College.